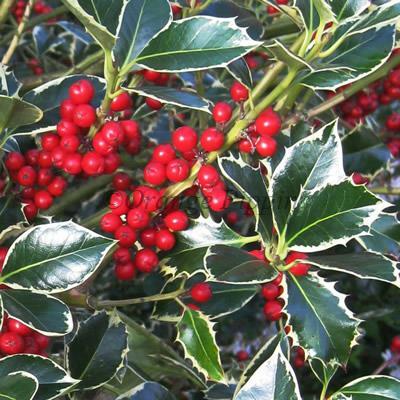 Ilex aquifolium 'Argentea Marginata' or silver-margined holly is a cone-shaped evergreen shrub or small tree of a dense, bushy habit with lovely green, prickly leaves which are margined with creamy-yellow and flushed pink when young. Small white flowers are followed by masses of bright red berries if planted with a male variety, producing a wonderful show during the autumn winter months. This easy to grow shrub is ideal planted as a specimen or within a mixed border to create an architectural feature and can be used as hedging.